Broman Cellars is a lifelong dream realized by Bob Broman. 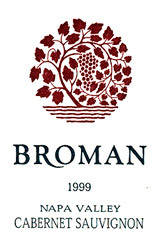 After making wine for other folks for 31 years, Bob along with his wife Deborah, released their first Napa Valley wine, appropriately labeled, Broman Cellars. The inaugural release was 150 cases of a beautiful 1994 Napa Valley Cabernet Sauvignon. Today, Broman Cellars is a family passion, with daughter Lisa also working side by side with Bob at the winery handling the sales, marketing and day-to-day duties. Production is now a whopping 1,300 cases consisting of ultra premium, hand-crafted lots of Cabernet Sauvignon, Syrah and Sauvignon Blanc.